12:45PM Fri.: press availability before state legislative hearing, 160 N. LaSalle St.
1PM Fri.: IL General Assembly subject matter hearing, C-600, 6th floor, Bilandic Building, 160 N. LaSalle St.
1PM Sat., 2/9: Rally with CICS strikers, CTU HQ, 1901 W. Carroll. Please RSVP @ chrisgeovanis@ctulocal1 so we can reserve space for reporters and cameras. CTU strikers and staff to testify on CICS use of CMOs to siphon public dollars out of classrooms and into bloated bureaucracies, insider investments and cash hoarding. 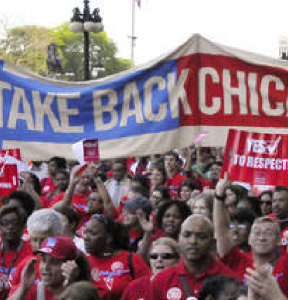 CHICAGO—As the CTU strike of charter operator CICS moves into its fourth day, state legislators are increasingly alarmed about what they’re learning about how CICS’s shell management companies undercut the amount of public education dollars that go into classrooms. Legislators have scheduled a ‘subject matter’ hearing on those charter management structures at 1PM TODAY at the Bilandic building at 160 N. LaSalle, on the sixth floor in room C-600. Before the hearing, at 12:45 PM TODAY, strikers, CTU officers and staff will hold a press availability to outline their testimony and update reporters on the strike—then head up to testify on CICS’ shady financial practices, and how that allows management to siphon off millions of dollars a year from school communities. On Thursday, elected officials joined strikers at a picket of INCS, the Illinois Network of Charter Schools, the well-oiled lobby for the charter industry that has backed CICS intransigence at the bargaining table. Supporters included aldermen David Moore (17) and Derrick Curtis (18), who both have CICS schools in their wards, plus Roberto Maldonado (26), Milly Santiago (31) and Tom Tunney (44). Cook County Board President Toni Preckwinkle kicked off the press conference, joining her colleagues in condemning CICS foot-dragging at the bargaining table, as well as the charter operator’s hoarding of $36 million in public funds that management has refused to invest in classrooms. Aldermanic candidates Mike Rodriguez (22), Erika Wozniak (a CTU member running in the 46th ward), Rafael Yanez (15), Robert Murphy (39) and Cleopatra Watson (9) also attended to lend support. The full press conference can be viewed at this link. Strikers will be on the picket lines again on Friday, after another day of bargaining that failed to produce an agreement. Management continues to insist on increasing class sizes and continues to reject language that would help enforce this by creating financial deterrents and hiring additional staff if management continues its chronic practice of ignoring current class size limits. Despite the union’s extensive financial analysis documenting that management has more than enough resources to sustainably cover demands for student services AND living wage salaries and benefits, management has refused to budge from its current position. Management is still insisting on making it easier to fire teachers, and on cancelling maternity/paternity leave benefits for paraprofessionals. On healthcare, management is insisting on taking away a portion of what they cover for individual health care and ‘trading’ that cut with a marginal increase in coverage for families, which remains outrageously expensive. Bargaining is also stalled on counselor caseloads, with management insisting on increasing already high caseloads – allowing them to lay off staff. While CICS has offered teachers and paraprofessionals raises, their offer would still leave educators significantly behind their peers in CPS over the life of the contract. Management is also refusing to honor outside years of experience and service or to provide pay retroactive to the date the contract expired last summer – essentially rewarding themselves for dragging their heels at bargaining since May. 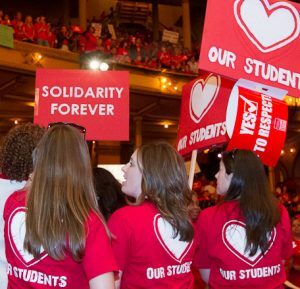 The Chicago Teachers Union represents more than 25,000 teachers and educational support personnel working in Chicago Public Schools, and by extension, the nearly 400,000 students and families they serve. The CTU is an affiliate of the American Federation of Teachers and the Illinois Federation of Teachers and is the third-largest teachers local in the United States. For more information please visit the CTU website at www.ctulocal1.org. CTU is fighting for quality pay and benefits (including health care), full staffing in our schools, smaller class sizes and justice for students and families. Get updates and resources for our contract fights here.